Categories: Art & Architecture | Tags: Blackheads, cathedral, Cork, Croatia, Denmark, doors, Duomo, Estonia, Ireland, Italy, Ljubljana, New York, Olympia, Pisa, Ribe, Slovenia, Split, St Fin Barre, St. Bartholomew, St. Domnius, St. John the Divine, St. Nicholas, state capitol, Tallinn, top 5, Washington, Wort Hotel, Wyoming | Permalink. Stephen these doors are all stunning in their own right. 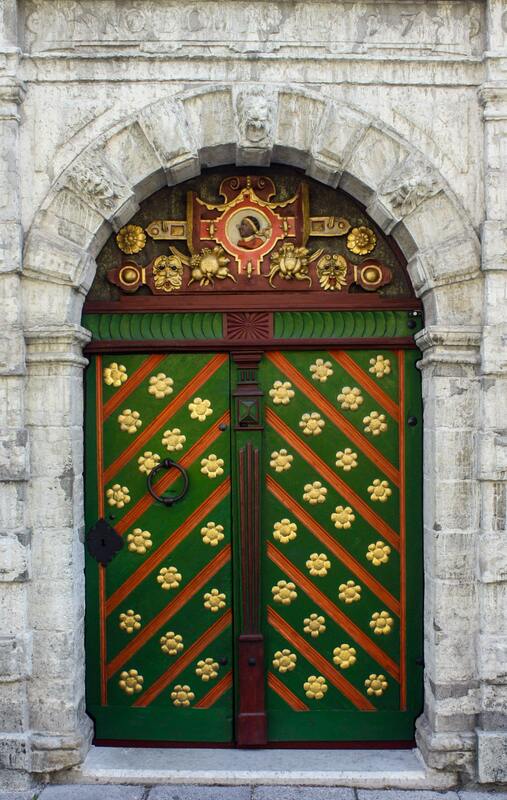 I’m thrilled to see a U.S. door made the list, and the one in Estonia makes me happy just looking at it. Based on that color scheme it only seems appropriate that they began the public display of Christmas trees!! Thanks, Deb! Yep, the one in Estonia was definitely eye-catching. Glad you liked them! Some beauties there. I remember seeing the door in Tallinn, and have a cheesey photo of me by it. There was a queue of people waiting to have their photo taken next to it! I managed to squeeze in this photo between people doing just that!